Creating a family portrait memory wall with your favorite family portraits will instantly personalize any space. Whether it’s your bedroom, living room, entry way, basement or kids spaces it’s sure to bring a lot of smiles over the years. There is nothing I love more in a home then a beautiful family portrait memory wall display. hammer, nails and a level. Here comes the fun part. Start to gather the prints you would like to share on your wall. Do you need to have prints made from digital images? Are there photos around your home that you’d like to move onto your new gallery portrait wall. Select photos that tell your family story and bring you joy. The best gallery portrait walls are ones that vary in frame sizes and textures. 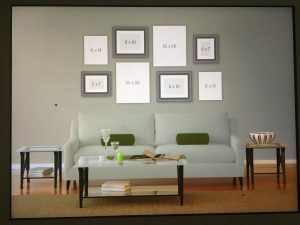 You can mix and match different photo display styles (canvas, frame, acrylic, wood) to keep your gallery portrait wall interesting (samples here). Find a general color scheme that complements the tones in your home. Gather different styles and colors of frames but don’t go overboard. Stick to your color palate and use just 3 or 4 colors including the color of the wall. Feel free to add in some quotes or personalized signs to add depth and meaning to your gallery portait wall. My favorite designer is White Willow Designs Co on Etsy. Begin by laying all of your ready to hang photos and memorabilia on the floor. Starting with one or two larger pieces centered will anchor the collection. Start building around that main piece by adding one piece to the left then to the right, one above and below. Get the drift? This helps keep balance and keeps the display easy on the eyes. A good tip is to measure the wall space you plan to use then mark it off on the floor using the painters tape. Using the painters tape, you can also tape your display on the wall to visualize the how the final gallery portrait wall will look. Plan to leave 2″ or so in between each photo to keep the flow of your story. Many fear hanging photos on the wall. I assure you, it is nothing to be afraid of. Nothing is permanent and everything is fixable. Your portraits can be moved around if you’re not 100% happy. Pull out your hammer, nails, and level and start by hanging the first piece on the wall. *please see this article on hanging photos 101 before hanging your art. It’s best to start by hanging the largest piece a bit off center or two pieces over a center line. This will anchor the collection. Then begin to hang all other pieces and build off of that.That’s it! Your gallery portrait wall is complete! Time to sit back and enjoy your new gallery portrait wall.